ACV moved into a new room all its own in 2007 to cut down on the noise level and the new venue brought a host of new faces as well. Four new laurelists replaced the usual suspects as four games were played in the opening Heat with only Kevin Youells and Shantanu Saha repeating. 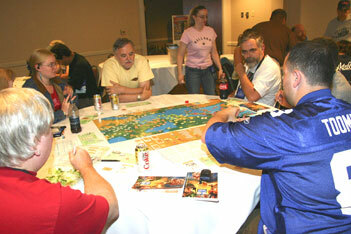 The 2007 tournament was an exceptional opportunity for competitive gaming and social interaction. There are several things of interest to note about this years event. First, the tournament was located in the Kinderhook Room. This salon style venue provided a quiet, congenial and well air conditioned atmosphere. Second, for the second year in a row we had a total of 50 positions played with four 7-player games in Heat 1, two more in Heat 2, and an 8 -player Final. Third, the most successfully played nations this year were Assyria with an average finish of 2.167 followed by Thrace with an average finish of 3.800 and the lowest average finish was Illyria at 5.143. Fourth, many of the more experienced players were absent this year allowing for several newcomers to make a Final appearance. Conspicuous by their absence were Doug Gallulo, Charlie Hickock, Joe Lux, Jamie Tang, Eric Gundersen, and Tedd Mullaly, to mention but a few. Hurry back. 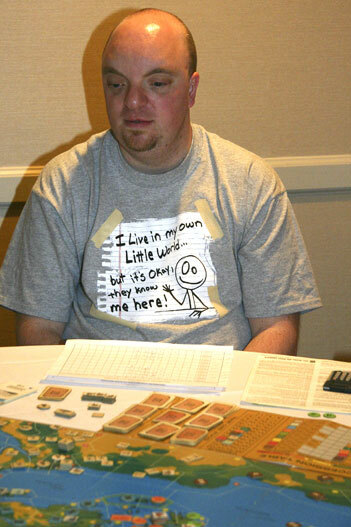 Defending champ and GM Joe Gundersen was the only past champion in the field which may have made him a marked man. The Final was a tough test even absent many of the traditional sharks. The game started with the traditional random drawing of the nations to be played. As one of my friends once stated, "at this level of skill you should be able to play any of the positions". 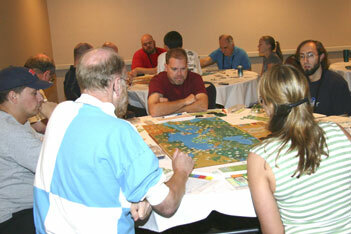 Once enjoined, the game progressed with the typical declarations and negotiations for national boundaries. Also, worthy of note in the context of general comments, is that the Final did not go to completion this year because Crete, played by Kevin Youells, was so far in the lead that no one could catch him, finishing with a 1000 point lead over the closest opposition. The first big event in the game was a trade dispute between Iberia and Illyria. This dispute lasted a number of turns with declarations of war "for the rest of the game" if the affront was not rectified. After a few turns the war to end all wars resolved it self into a more peaceful understanding of mutual tolerance and never reached a complete settlement. Unfortunately for Iberia this war along with his "I will not let you win" strategy relegated him to a last place finish. Illyria, on the other hand, worked hard the rest of the game to restore his position sufficiently to manage third place laurels. His philosophy of "I am too weak, no one will bother me" allowed him to maximize his purchases for discount cards rather than expensive advances for protection like Medicine. Assyria and Babylon reached an understanding on mutual borders and worked well together throughout. Unfortunately, this opportunity to mutual success was struck down by the early collapse of the Assyrian Empire. Assyria was the primary target of one calamity and the recipient of many secondary effects during the first big turn of numerous calamities. Assyria then suffered from several turns with bad card draws where more than half were calamities which for a while relegated him to last place. Even after being placed in the last place position, the secondary effects were still targeted on this ailing empire. Babylon on the other hand, had a good game, only in the end to suffer from the treacherous Egyptians and the vengeful Iberians. Some of the early success for Babylon could be attributed to the acquisition of the entire book of bronze in mid-game from his friendly neighbor Assyria. The Babylonians reciprocity for this early boon helped Assyria limp from the cellar to a seventh place final ranking. Africa, Thrace and Egypt played good games but never quite reached the pinnacle of success required to threaten the leader. Africa easily reached six cities early in the game, but remained there until the last three turns when he reached eight cities. This continual low city count took him off the glide path to success relegating him to a 4th place finish. Thrace, played by our Canadian comrade, did well in the early game achieving eight cities only to languish in the mid- and late-game with five or six cities. He found the Final to be played by "a great group of guys" and a wonderful opportunity to learn a few lessons. Egypt did well for most of the game although suffered from lower city counts in the mid-game. Egypt was also the primary recipient of more calamities in the game than any other position including two civil wars - one of which was on the last turn. Egypt fought well against these adverse conditions and his achievement of second place laurels is a clear indication of better days to come. The winner, Crete played an excellent game. He started by going east towards Rhodes and Asia Minor and followed that a few turns later with a move to the Peloponnesus to lock in some city sites. In the early game he avoided the curse of being the primary recipient of calamities thruough careful trading and the secondary recipient of calamities by selectively noting that he was in last place. In mid-game he established a nice steady state empire with nine cities that also allowed him to purchase a gold card regularly for five turns. In the late-game his very advanced empire easily withstood the few assaults that were directed his way. Interestingly, Crete was the primary recipient of an average number of calamities; nine in all, but of those six were from Barbarian Hordes which had no effect. In the end, a Crete victory was well assured and the last turn of the game was not played by unanimous consent. Kevin Youells noted at the end of the game, "that finally after seven years in the Final round, he had struck gold". Indeed he did. .